This Mistake Finding Picture Riddle is dedicated to Gin Rummy game. In this given picture riddle, there is image taken from Gin Rummy Card Game. However there is one mistake in this picture. Your challenge is find this mistake as quickly as possible. Lets see how much time you will take to find this mistake? 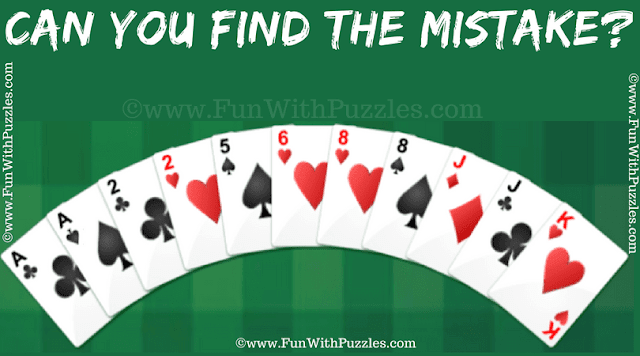 Answer of this "Mistake Finding Picture Riddle", can be viewed by clicking on button. Please do give your best try before looking at the answer. Finding the Mistake in given picture will tested your observational skills. Do checkout below listed fun puzzles and brain teasers to test your visual skills and logical analytical ability. Tough Picture Puzzles for Adults: It contains very tough picture puzzles in which your challenge is find the hidden animals in the given picture puzzle images. What is Next Number In The Sequence? : These are Maths and Logic puzzles in which your challenge is to find the next number in the series of number which follows a particular pattern. Quick Solving Maths Brain Teasers with Answers for Kids: These are very easy Maths puzzles which kids will love to enjoy to solve. Logical Pictures Brain Teasers with Answers: At last set of some logical picture puzzles which will twist your brain.